The ocean heat uptake has doubled since 1997 resulting in warmer surface layers of the oceans, as well as increasing ocean warming at greater depths. One of the symptoms of this can be seen in the rapid warming of the Indian Ocean. This ocean has the largest warming trend in sea surface temperatures in the tropics over the past century. This has resulted in a 20 per cent reduction in primary plankton productivity for the period 1998 to 2013, contributing to reduced fish stocks and adding a threat to food security. 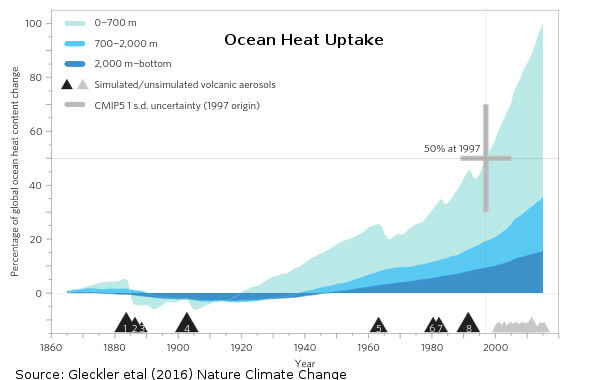 The latest analysis show that ocean heat uptake has doubled since 1997. The world's ocean's absorb about 93 per cent of the sun's radiation. Warming is occurring at all levels: the surface waters to 700m continues to warm rapidly, while midlevel depths between 700m and 2000m, and below 2000m is warming more slowly as the ocean's layers mix the layers. The study found that over a third of the accumulated heat occurs below 700 m and is steadily rising as a proportion. The graph of ocean heat content does not show any pause that is discernable, unlike the 18 year period in the atmospheric temperature record, although this 'pause' is clearly ending with a resumption of trend. "We show that the multi-model mean constructed from the current generation of historically forced climate models is consistent with the OHC changes from this diverse collection of observational systems. Our model-based analysis suggests that nearly half of the industrial-era increases in global OHC have occurred in recent decades, with over a third of the accumulated heat occurring below 700 m and steadily rising." the researchers conclude. Climate sceptics used the 1997 El Nino record heat to cherry pick the start of a trend over a relatively short period. Multi-decadel ocean cycles can produce variability in the global atmospheric temperature trend. Most climate trends are done on at least a 30 year period to avoid natural variability. I looked at this issue in February 2014 as part of the Exeter Climate MOOC course I did: Exclimate: Are recent global temperatures predicted by climate models?. Peter Gleckler, lead author of the paper, told The Guardian, “When we discuss global warming, the most familiar way we do that is talk about temperature changes on the surface – but it’s clear that the oceans are doing the bulk of the work in terms of absorbing the heat in the system,” he said. “And if we want to really understand how much heat is being trapped, we can’t just look at the upper ocean anymore, we need to look deeper. “The findings are concerning. It’s clear evidence that the oceans are taking the brunt of the greenhouse gases and are accumulating a lot of heat. As for the ecological implications, that’s hard to say. There is a lot of life in the deep oceans and there’s lots we don’t know about the impact upon that life.” said Gleckler. Prof. John Shepherd, Professorial Research Fellow in Earth System Science at the National Oceanography Centre, University of Southampton, said the ocean heat uptake was a bit of a mixed blessing. "Once the ocean heat uptake settles down again, the rate of warming is likely to return to what it was before. The extra heat will either remain in the ocean, where it may affect both ocean and atmospheric circulation patterns, and so contribute to unusual weather patterns like El Nino, or it may be released to contribute to more rapid or prolonged warming later on. It’s certainly not a cure for climate change, nor any reason to be less concerned about it". Multidecadel cycles in ocean circulation like the Pacific Decadel Oscillation (PDO), Atlantic Multidecadal Oscillation (AMO) and North Atlantic Oscillation (NAO) have a major role to play. Recent research also shows that the Atlantic ocean Meridional Overturning Circulation (AMOC) also appears to be slowing. In 2015 the Pacific Decadel Oscillation turned positive in conjuncton with another strong El Nino. This has pushed some of the accumulated warmth up from the ocean to the atmosphere helping 2015 to become easily the hottest year on record. A news report from Todayonline reports that Warming Indian Ocean is ‘an ecological desert in the making’ with fish stocks and catches declining. “Rapid warming in the Indian Ocean is playing an important role in reducing phytoplankton up to 20 per cent,” said Adjunct Associate Professor Mathew Koll Roxy, a scientist at the Centre for Climate Change Research at the Indian Institute of Tropical Meteorology in the Indian city of Pune. 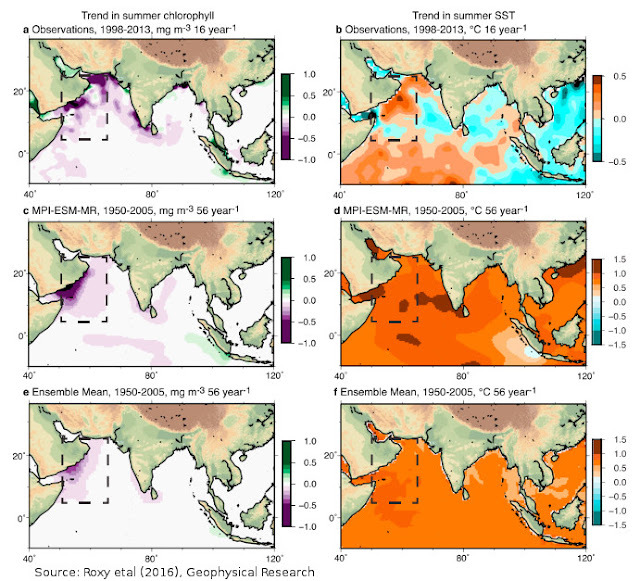 The study concludes that in the Western Indian Ocean in particular there is "an alarming decrease of up to 20% in phytoplankton in this region over the past six decades. We find that these trends in chlorophyll are driven by enhanced ocean stratification due to rapid warming in the Indian Ocean, which suppresses nutrient mixing from subsurface layers. Future climate projections suggest that the Indian Ocean will continue to warm, driving this productive region into an ecological desert." The Indian Ocean is the region with the largest warming trend in sea surface temperatures in the tropics over the past century, Koll explains. "The warming during the past century is up to 1.2°C, which is very large compared to a global surface warming of up to 0.8°C during the same period." "In the recent decades, the coastal winds over this region have strengthened, and ideally, this should enhance the nutrient mixing and phytoplankton blooms. On the contrary, the current study using quality-controlled blended chlorophyll data and Earth system model simulations points out an alarming decrease of up to 20% in marine phytoplankton during the past six decades. The observations indicate that the phytoplankton decline is large during the past 16 years, with a decrease of up to 30%. We find that these trends in chlorophyll are driven by enhanced ocean stratification due to the rapid warming in the Indian Ocean, which suppresses nutrient mixing from subsurface layers." the researchers explain. While stocks of fish like Tuna have been overfished, the reduction in phytoplankton has probably also been a factor in reduction of fisheries. The Indian Ocean accounts for about 20 per cent of the total tuna catch, especially of bigeye tuna, making it the 2nd largest supplier to world markets. "Available data show that the tuna catch rates in the Indian Ocean have declined by 50–90% during the past five decades [Myers and Worm, 2003; Polacheck, 2006]. Increased industrial fishery is a major cause for such a huge decline. However, the reduced phytoplankton may add up as a potential stress factor in the recent decades and exploiting a resource that may be in decline can tip it over to a point of no return. Despite a long-term decline in the tuna catch rates, there is a slight increasing trend in the catch rates in the recent decades during which the chlorophyll concentrations decreased, which suggests that ecosystem responses in the food web are complex, especially when highly migratory species are involved. Careful data gathering is needed to understand the totality of the ecosystem response to changing stratification, especially in terms of the fishery yields and disease pressures." In 2013 a scientific study identified for the first time that ocean warming and sea surface temperatures were affecting global fisheries stocks. As sea surface temperatures (SSTs) rise fish respond by moving either deeper or to higher latitudes. (See: Heading for cooler waters - Climate Change Impact of warming oceans on global fish stocks) Now it seems with rising SST there is a reduction in plankton productivity which may also be a factor in driving fish migration to cooler waters. "As a consequence of this, very high water temperatures were observed in many parts of the oceans, particularly in the tropical Indian Ocean, often with temperatures of 3 degrees to 5 degrees C above normal. Many corals in this region bleached and subsequently died, probably due to the high water temperatures in combination with meteorological and climatic factors. Massive mortality occurred on the reefs of Sri Lanka, Maldives, India, Kenya, Tanzania, and Seychelles with mortalities of up to 90% in many shallow areas. Reefs in other parts of the Indian Ocean, or in waters below 20 m, coral mortality was typically 50%. Hence, coral death during 1998 was unprecedented in severity. The secondary socioeconomic effects of coral bleaching for coastal communities of the Indian Ocean are likely to be long lasting and severe. In addition to potential decreases in fish stocks and negative effects on tourism, erosion may become an acute problem, particularly in the Maldives and Seychelles. If the observed global trends in temperature rises continue, there will be an increased probability of a recurrence of the phenomenon observed in 1998 on the coral reefs of the Indian Ocean, as well as in other parts of the tropical oceans in coming years. Coral reefs of the Indian Ocean may prove to be an important signal of the potential effects of global climate change, and we should heed that warning." While tuna catch rates vary in accordance with climate oscillations (Menard et al 2007), it is clear warming ocean temperatures are driving changes in abundance of fish and fisheries. Research by K.M. Brander (2007), in Global fish production and climate change, writes that "There are strong interactions between the effects of fishing and the effects of climate because fishing reduces the age, size, and geographic diversity of populations and the biodiversity of marine ecosystems, making both more sensitive to additional stresses such as climate change. ... The frequency and intensity of extreme climate events is likely to have a major impact on future fisheries production in both inland and marine systems." Brander argues in his research that reducing fishing mortality in fully exploited or overexploited fisheries is the principal feasible means of reducing the impacts of climate change on these fish stocks.